Oakland Indie pop band Trails and Ways has been making some noise on the music blogs these past few months with their standout covers of some of this year’s most popular songs (i.e. M83’s “Midnight City,” Miike Snow’s “Animal,” etc.) as well as their own original material. 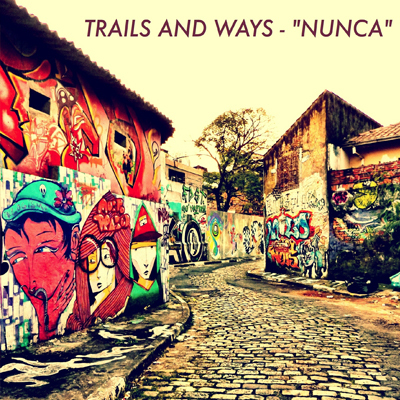 The lead single off of their full-length LP Trilingual, “Nunca” is a laid back song that the band came up with during a trip they took to Brazil. Although it’s more of a summery kind of song, its upbeat vibe should be able to help you overcome the gloom and doom that comes with rainy weather. Trails and Ways will be opening for this year’s The Bay Brewed (a rock & roll/beer festival; more details here) on Saturday. If you’re in need of some entertainment this weekend, definitely check it out. While some people would consider being “too safe” to be a good thing, I actually think that it can be a bad thing. A little bit of risks does our lives some good in the sense that it helps us build new experiences we otherwise would not have experienced had we stayed inside our comfort zones. Those newfound experiences help minimize the stretches of boredom we may experience from our usual routines by keeping our lives fresh. A shoe-gaze pop diddy, Alpine’s “Too Safe” can be seen as a good reminder to surround yourself with people who can help push you to step outside your comfort zone. Living a “safe” lifestyle is totally fine, but eventually doing the same things over and over will start to bore you. Just as we feel compelled to listen to new songs because of tiring from all the other stuff we listened to countless times on our iTunes libraries, so too should feel compelled to keep trying different things. Whether it’s hanging out with new friends, hitting up a new bar or restaurant, or engaging in some new extreme physical activity, don’t be afraid to break up the monotony of your lifestyle and step outside your comfort zone. The latest body of musical work to have the music blogosphere buzzing comes surprisingly from Beyoncé’s younger sister Solange. A 7-track EP, True has been receiving blog-wide praise for its successful attempt to blend elements of both R&B and Indie into a unique sound that Solange can truly call her own. Unlike her superstar pop-diva sister, she is very much into the indie music scene (she attended a Grizzly Bear concert in Brooklyn three years ago and famously brought Beyoncé & her hubby Jay-Z with her) and True is reflective of that. The first single off the LP, “Losing You” is a break-up song that you would expect to be depressing based on its lyrical content (“Tell me the truth boy am I losing you for good?”), but actually may end up leaving you feeling good because of its upbeat vibe and goofy background sounds. For me, that irony is what makes this track so cool because it’s something so far removed from typical mainstream R&B (i.e. Trey Songz, Avant, Beyoncé, etc.) in terms of the way it sounds. It also helps that the songs on the album are all originals co-written and co-produced by Solange and Blood Orange frontman Dev Hynes. While her next album isn’t due until 2013, True is an EP which you should definitely check out if you’re in need of some quality new music. You can stream a few of the tracks here. If you like what you hear, be sure to show Solange some love and cop the EP on iTunes. I was stuck on indie pop band Tennis’ latest LP Young & Old for a good minute and this song is one of the reasons why. The first single off the album, “Origins” is an uptempo indie/surf pop ballad which features the beautiful vocals of lead-singer Alaina Moore (one half of the husband-wife duo) floating smoothly over a live instrumentation-filled beat comprised of nothing more than two piano chords, a subtle bassline, standard percussion, and a few guitar rifts. Taken together, these two elements combine to form a song that is simple in terms of its overall structure, yet sounds great because of how well each of those elements compliment one another throughout the song. Add in the fact that its got some pretty fun lyrics to sing (specifically the “uh-oh uh-oh oooo-uh-ohs” in the background during the chorus) and you end up with a song that just sounds awesome. If you like what you hear, be sure to check out Young & Old as it is arguably some of the best indie pop to hit the music scene this year. It’s been a bit of a dry spell in terms of new music these past few days what with everyone’s attention being focused on the Thanksgiving festivities. However, British R&B singer Jessie Ware and Japanese teenage production duo BenZel were kind enough to release the video to their awesome collaborative cover of R&B group Brownstone’s hit “If You Love Me.” Directed by Haley Wollens, the video offers some pretty cool visuals of a stripper pole dancing on an almost empty subway and diving into a pool. Trippy stuff, but it suits the song just fine. With fall drawing to a close and winter approaching, you would think it’d be cold in most places this time of year. It’s been far from that out here in San Francisco as it’s been fairly sunny with temperatures around 60 degrees. Today’s weather was so nice in fact that I decided to go for a nice long run on the beach. San Francisco winter weather may be lagging, but that’s not necessarily a bad thing. Fittingly enough, San Francisco is home to DJ/producer Viceroy; an artist who lives summer 365 days a year. Starting out as a DJ who played local college parties during his senior year back in 2011, Viceroy (real name Austen Afridi) has made a name for himself by creating music which seeks to capture the essence and feel of Summer. The tropical vibe given off by his remix of Mark Morrison’s 90s hit “Return of the Mack” will have you feeling as if you sipped a Pina Colada and suddenly got transported to an island paradise filled with the wonderful synths and sounds of Nu-disco. Sit back, relax, and enjoy! Because it’s Thanksgiving weekend, a lot of us have been living these past few days relatively stress free. With Thanksgiving over and Black Friday virtually done, there really isn’t anything left to stress about. As such, Dragonette’s “Let it Go” is the perfect song to unwind to and start your weekend with. I don’t really have much time to go in depth because my friends from out of town are dragging me out against my will, but rest assured “Let it Go” is an awesome track. Relax, unwind, and just let that stress go. Cheers to the weekend.